Hausa is a West Chadic language spoken by approximately 35 mill. native speakers in Northern Nigeria, Southern Niger and Ghana, and is moreover one of the most important linguae francae in West Africa. Due to this there are altogether about 50 mill. Hausa speakers. A general introduction and different geographical and ethnographical main fields within the single lessons help to intensify the cultural context of this language. The practical part has been redesigned completely and has also been completed with geographical and cultural information supported by text examples and illustrations. The former order of the presented subjects is maintained to a larger extent, but was updated to the latest level. Each of the 30 lessons consists of three parts: Part (A) presents a dialogue or subject area, part (B) a grammatical analysis which shortly explains the newly introduced and practiced grammatical material, and part (C) which consists of exemplary sentence lessons, short texts and exercises. The list of words in the appendix contains the vocabulary used in the lessons. The lessons are anteceded by an introduction into phonetics of Hausa – which is a stress-accented tone language – also including an introduction into the prosodic structure. Vowel length is marked by the doubled representation of the vowel. As far as tone is concerned, only the high tone is marked because most of the high-tone syllables in Hausa have an accent as well. The Audio-CD, which can be ordered separately, consists of texts read by Nigerian native speakers. This textbook is meant for teaching in classes of African Studies but is also applicable as a practical guidance for anyone interested in this language. [...] bin ich der Meinung, dass das "Lehrbuch der Hausa-Sprache" zur Zeit das beste Hausa-Lehrwerk auf dem deutschsprachigen Markt ist und ein sehr guter und vielseitiger Hausa-Unterricht damit gemacht werden kann. Den drei Autoren und ihren auf der Titelseite genannten Mitarbeitern [...] kann man gratulieren: es ist ihnen damit ein großer Wurf gelungen, denn es gibt bisher kaum ein Lehrbuch für afrikanische Sprachen von vergleichbarer Qualität. 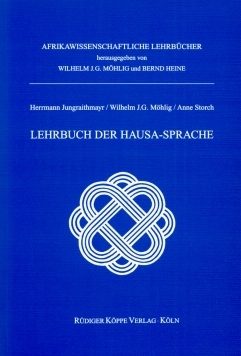 [...] this handbook is a real success of the German Hausaists, which will facilitate the acquiring of the practical knowledge of Hausa, and serve the general linguists in grasping of the main traits of its structure. It makes the reader familiar with the Hausa culture and their way of life, which is rather a seldom case as far as the other books of this kind are concerned. The proposed methods of learning seem to be quite effective although they require more time and patience.